The 20–0 Tritons continued their dominant campaign on Saturday, Feb. 9 and Thursday, Feb. 7, taking down both the visiting California State University, San Bernardino Coyotes and the California State Polytechnic University Pomona Broncos at RIMAC Arena. 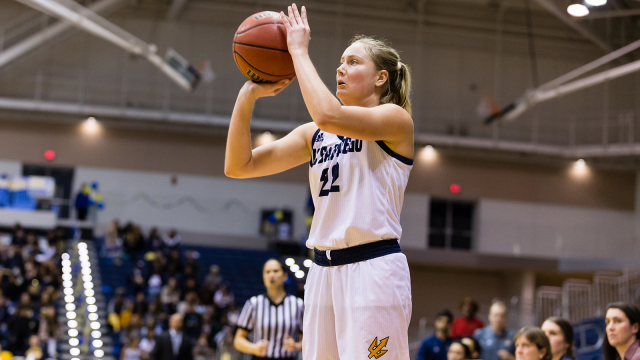 In the Saturday matchup, UC San Diego beat San Bernardino State 71–49, overcoming a slightly underwhelming shooting performance, as only three Tritons finished in double-digits. Junior forward Mikayla Williams and Junior guard Sydney Sharp led the team in scoring with 19 and 18 points, respectively, to go along with a pair of steals each. UCSD wasted no time in this one, going up 20–9 at the end of the first quarter and never looking back from there. After overcoming a 10-second lead, the Coyotes held at 7–6 until a Williams layup brought the Tritons back on top. Despite being outscored 20–16 in the third quarter, the Tritons left the home crowd with no doubt about who was the better team at the end of the game. The Thursday win over the Broncos looked a lot more like a 2019 UCSD performance, with five Tritons scoring in double-digits in this one. The team knocked down plenty of threes in the big win, hitting on 15 of 28 attempts, while Cal Poly Pomona lagged behind with just 5 3-pointers made in the game on 19 attempts. Sharp led UCSD on offense, with plenty of support from the other starters. Sharp dropped 26 points, followed closely by junior forwards Haleigh Hatfield and Williams, who scored 18 and 17 points, respectively. The win was not just impressive for the final score, but also in terms of the opponent. The Broncos came into the game with just one loss in California Collegiate Athletic Association play so far this season and an 18–2 overall record, making them the Triton’s closest CCAA competitor. But if comparisons between the two existed heading into the matchup, they were dispelled early on. The Tritons led the Broncos by 9 at the end of the first quarter, up 22–13, but the game did not become yet another UCSD blowout until the second quarter. The Tritons put up a whopping 31 points in the second, giving the second-ranked home team a commanding 53–31 lead. Despite the two teams seemingly trading blows during this quarter, Cal Poly Pomona had a hard time putting runs together, and trading baskets with a team as prolific from deep as UCSD is a recipe for disaster. While the Tritons had no real problems in the blowout, the team did miss some free throws, going just 8–15 (53.3 percent) from the charity stripe, compared to the Broncos who went 13–18 (72.2 percent). While this didn’t matter in the matchup, UCSD will need to hit a higher percentage of their free throws once they start facing some stiffer competition in the playoffs. The team will remain at home next week, taking on California State University, Dominguez Hills on Thursday, Feb. 14 at 5:30 p.m. at RIMAC Arena. If the Tritons can finish out the rest of their CCAA schedule as strongly as they have dealt with the opposition thus far this season, the team will secure a first place CCAA finish for the fourth straight season.